Today marks the official launch of “Prefer,” a new product that helps you find professionals you need (whether it be a personal trainer, babysitter, accountant…any trusted professional) from people you know. Our mission is to empower the careers of service professionals that thrive on relationships and referrals, and make the world a little smaller for the rest of us. A few years ago, after a string of cross-country flights that left my back in excruciating pain, I was referred by a friend to an amazing massage therapist in New York City. She worked wonders, and I have since referred her to family and friends. One evening, after a year or so working together, I asked her why she was represented by a representative. I didn’t understand why, whenever I wanted to book a massage, I had to go through someone else. My massage therapist explained that, while she preferred referrals from her clients, she needed help conjuring up more vetted clients and with handling backend operations like scheduling and billing. She paid a hefty 30% of her income to the agent that represented her. It didn’t make any sense. In the age of social graphs and mobile payments, how could such an amazingly talented professional struggle to build her own client base and manage her business independently? It’s not a new problem. Service professionals of all kinds — accountants, tutors, hair-stylists, copywriters — have long opted to join firms, agencies, salons, and other structures in order to get clients and operate efficiently. More recently, technology has attempted to solve the problem through online marketplaces (3.5 star ratings from strangers, not so helpful), on-demand apps (proximity and price-based marketplaces - great for commoditized services like transportation or delivery, but that’s it), and bidding platforms (where the professional willing to pay the most gets the new client, not a meritocracy). These solutions have a giant blind spot: the professionals that come into our homes, take care of our families, and are privy to our personal lives and finances — these people are trusted relationships, not nameless dots and algorithms. You don’t want the cheapest acupuncturist or the closest acupuncturist or the one with a million anonymous reviews, you want a recommendation for the best acupuncturist from someone you trust. Relationship-driven professionals make up our country’s largest and fastest growing economy. But so far, technology has done more harm than good. Prefer helps Service Professionals get a steady stream of referrals from their clients’ friends, while offering a better booking and payment experience to their existing clients (no more hassle of texting back-and-forth to schedule an appointment and last-minute ATM runs to get cash). For the rest of us “clients,” Prefer helps us find the professionals we need from people we know. Under the hood, we’ve built easy payment and booking tools as well as a “referral graph” that lets you see the professionals your friends use and recommend to their friends. Prefer brings all of the professionals you need to your fingertips, as well as professionals you never knew you wanted. Aside from finding the last minute babysitter and the perfect dog walker, early beta testers in NYC have booked Specialty Cocktail Makers that whip up memorable concoctions and Nightlife Consultants that plan the ultimate night out. 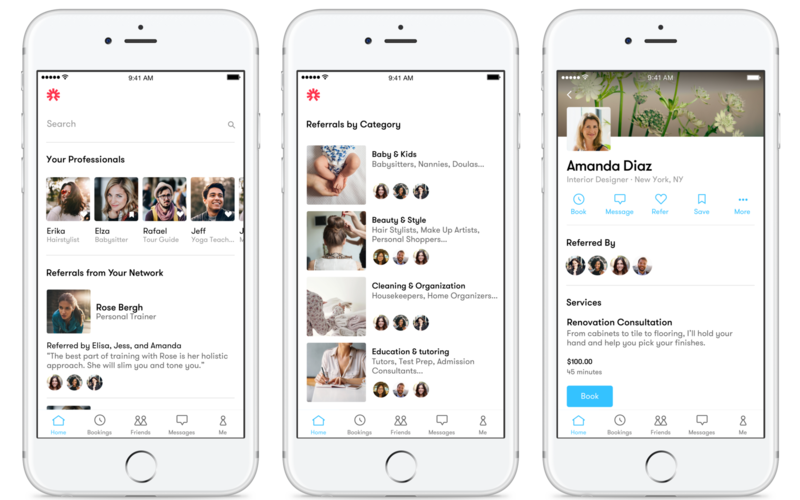 Prefer’s “client app,” where you can easily book and pay your favorite service professionals and discover professionals of all kinds recommended by your friends. Prefer brings back the sensation of living in a small town, where relationships and reputations were paramount and everyone you work with was referred by friends. We’ve been testing Prefer for months in NYC and have kept it invitation-only to foster a tight-knit community from the start. Early feedback is promising — clients are discovering new services via their friends, and Service Professionals are inviting their clients to book them on Prefer. But we’ve got our work cut out for us! I feel honored to work with Julio Vasconcellos (CEO) and an incredible founding team driven by a deep understanding and empathy for the professionals we serve. I am also honored to represent Benchmark on the Board and lead the firm’s investment in the company. Our team has bold ambitions. We want Prefer to be your first stop whenever you need a service professional. With all of the professionals your friends use and recommend at your fingertips, there is no reason to go anywhere else. Over time, we want Prefer to become your modern interface for service, a single place where you can efficiently work with the service professionals in your life and discover new services via friends. Our product roadmap is also focused on building powerful yet accessible tools for service professionals to grow their business and strengthen relationships with their clients. We’re excited to build products that empower the careers of service professionals, while helping make the world feel a little smaller for the rest of us. Check out the Prefer team’s official launch post. Here’s a great analysis by Fast Company. If you’re in NYC, get Prefer now. Or join the waitlist and we’ll let you know when Prefer comes to your city!